A decade ago, Jessica Goldman Srebnick was afraid of walking through Wynwood, a derelict warehouse neighborhood in Miami. Today, she is the virtual curator of an open-air art gallery that has turned the area into one of the hippest places in the United States. Windowless factory warehouses in the bleak urban district have become a venue where artists, including internationally famous ones, paint murals that raise street art to new heights. The flourishing neighborhood — which recently made headlines as the first place in America where the Zika virus was locally transmitted — has about 70 art galleries and 20 restaurants. As it gentrified, rents skyrocketed, going from $3 to $6 per square foot to between $65 and $95 today. How did this transformation occur? The alchemy lies in buying up a critical mass of properties and having the vision of revitalizing a neighborhood while respecting its character. That is what Tony Goldman, the late father of Goldman Srebnick, did in the 2000s, when he focused his Goldman Properties, specialists in turning downtrodden areas into trendy hotspots, on Wynwood. The real-estate pioneer, for example, was the force behind the transformation of New York City’s SoHo neighborhood in the 1970s and Miami Beach in the ’80s. After beginning to buy up properties in Wynwood in 2006, Goldman Properties now owns 30, says Goldman Srebnick, who became chief executive after her father’s death in 2012. “It’s part of our model, where we buy a critical mass of real estate. Usually 18 is the minimum because that’s what you need to really make a change,” she said. 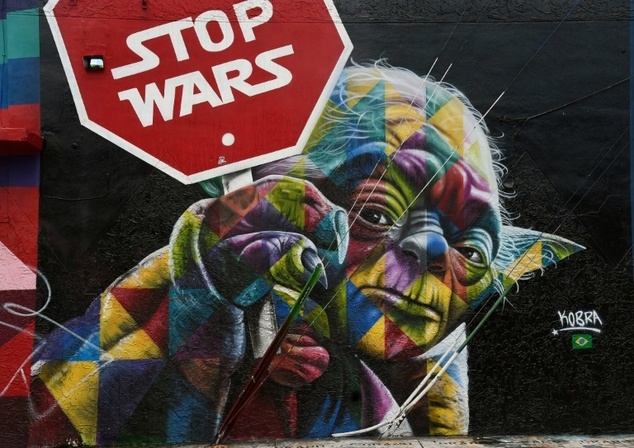 One of its properties is Wynwood Walls, a warehouse-turned-art showcase that greets visitors with a mural by Shepard Fairey, the celebrated artist of the “Hope” poster for Barack Obama’s 2008 presidential campaign. Unlike New York or Miami Beach, “with Wynwood there was nothing interesting about the architecture,” Goldman Srebnick told AFP. “What was really interesting was the street art. So we took that, because that was part of the soul of the neighborhood,” she said. The CEO emphasized that whenever the company focuses on an area “it’s not about coming in and imposing what we want on that neighborhood. Behind her at Wynwood Walls is the Fairey mural portrait of her father, smiling, his hands extended in welcome against a backdrop of golden beams. “One of the things my dad taught me was to see things how they could be, as opposed to what they are,” she said. “Wynwood has been an amazing place for art,” said muralist Chaz, 41, a member of the British-based duo The London Police. His painting features cartoonish figures set in a futurist world with realistic touches. Other murals feature the works of Japan’s Aiko, the Chilean Inti, France’s Miss Van, a Toulouse-born artist known for her sensuous women in masks, and Ron English, an American whose work features a “Hulk”-like baby. Wynwood Walls and its extension, Wynwood Doors, is changing the way the public interacts with art in general, and with street art in particular. It is hard to view one of the works without there being someone in front of it taking a selfie. “When you think of street art, you’re driving by it in a car, or you’re on a train,” said Goldman Srebnick. Without knowing it, a Venezuelan tourist agrees with her totally. “Here you can take selfies and share them. When you’re in a museum, you can’t, for example, start jumping up and down in front of the painting that you are viewing,” said Erika Freijah, 17, after a picture-snapping session with her family.